What a week! I spent the majority of every day taking in the sights and sounds of the Convention. It all started on Saturday night and continued through Thursday evening - with Tuesday through Thursday being anchored with the official convention events. New Hampshire had some of the best seats in the house, hands down. It was a great vantage point to see all of the speakers and performances - and we got lots of face-time on TV and the jumbo-tron! I had the opportunity to participate in A House United, a project conducted by Sears/Craftsman, and Rebuilding Together, to build half of a house at the Republican Convention and half of the house at the Democratic Convention. The house will be 'united' and donated to a veteran in North Carolina. I also got to meet Ty Pennington in the process. During the day I went to either Caucus meetings or to outside events like forums conducted by Politico or The National Journal/The Atlantic. I saw an interview of Madeleine Albright by Bloomberg - then ran into her on the street and shared a brief conversation with her. 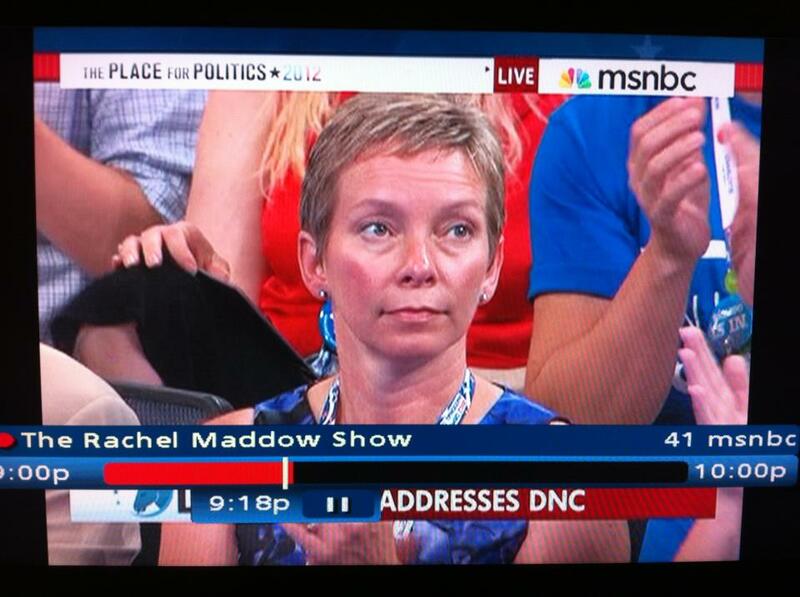 I got to wave to a friend from the background while Chris Matthews was taping. I saw numerous political celebrities on the street. Overall, it was a great experience. Charlotte did a great job of welcoming us to their city - despite the rain. I went to several museums for events and thoroughly enjoyed the regional cuisine. It was a great way to kick off the final leg of the 2012 election! You can see my blog entries with photos on Windham Patch here. Looking a little tired after 5 nights of 3 hours of sleep each... but what an experience!